2015 I WRAPS I 21 Consider the Competition I find myself sometimes pulling off the side of the road to look at wraps that our company did not create or install. I look for print quality, effective design, and how clean the installation job looks. Sometimes you can call that same company and ask who provided the wrap for their vehicle. We also look at our competitor's website from time to time to see what jobs or projects they have completed recently. If you see one of those vehicles on the road or parked, stop and check out the quality of work that they completed. I always let our potential clients know that we design, print, produce, and install all our wraps in-house. Nothing is subcontracted out so we can maintain control of quality and our attention to detail. 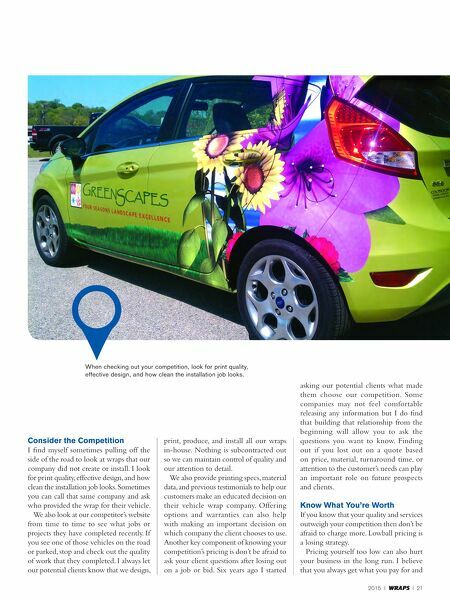 We also provide printing specs, material data, and previous testimonials to help our customers make an educated decision on their vehicle wrap company. Offering options and warranties can also help with making an important decision on which company the client chooses to use. Another key component of knowing your competition's pricing is don't be afraid to ask your client questions after losing out on a job or bid. Six years ago I started asking our potential clients what made them choose our competition. Some companies may not feel comfortable releasing any information but I do find that building that relationship from the beginning will allow you to ask the questions you want to know. Finding out if you lost out on a quote based on price, material, turnaround time, or attention to the customer's needs can play an important role on future prospects and clients. Know What You're Worth If you know that your quality and services outweigh your competition then don't be afraid to charge more. 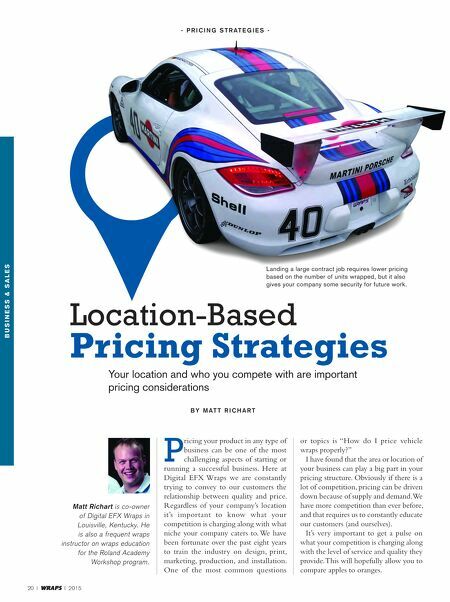 Lowball pricing is a losing strategy. Pricing yourself too low can also hurt your business in the long run. I believe that you always get what you pay for and When checking out your competition, look for print quality, effective design, and how clean the installation job looks.